Planning for the event started months ago. PR Links, the BVITB’s Puerto Rican agency laid the groundwork by hosting BVI Customs and Immigration, and Police to speak to Puerto Rican boaters about clearance and other related procedures including recent changes with fees. The trail to the beach was recently cleared and included the installation of boardwalk panels to bridge rough areas. The trail clearance was a collaborative effort of the Rotaract Club of Virgin Gorda, students from Bregado Flax Educational Centre’s Secondary Division, Women of Power and High Potential (WOPAHP) and BVI Tourist Board. This group was assisted by teenage summer camp groups out of the United States, Visions and Go Beyond as well as other individuals from the Virgin Gorda community. The trail was marked by Mr. Victor Stevens and his son Albert “Pop” Stevens of North Sound, Virgin Gorda. The event is well organized with the participants complying with the guidelines stipulated by organizers, and in accordance with BVI laws. Buoys, along with swim lines, are installed at the beach. Garbage collection, security, emergency services are all important components to ensure a fun and safe event. Christmas in July is the single most popular event attracting the Puerto Rican market, which along with the USVI are the most important regional markets for the Territory. 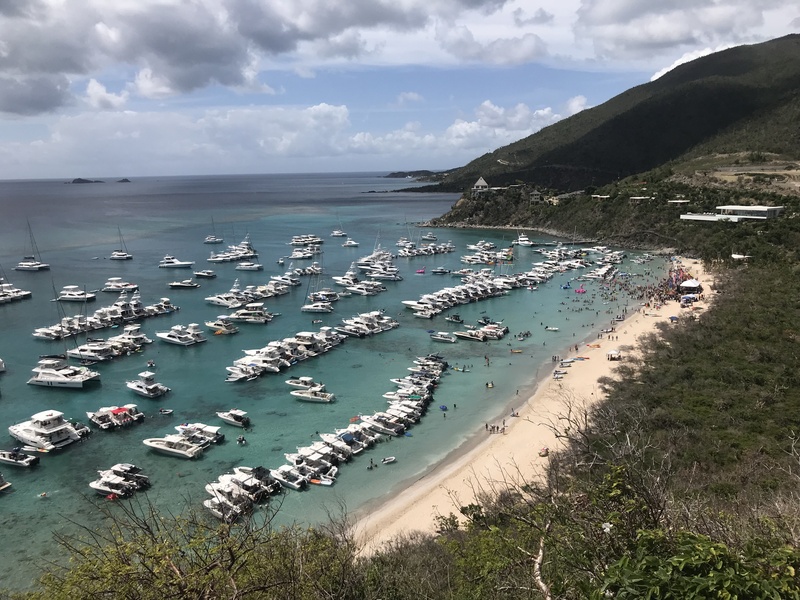 Christmas in July promotes island hopping with several boaters arriving early to go to their favourite beaches and watering holes. Also, this year, the event became a three-day event, starting with an appreciation event on Friday, July 20th, hosted by the legendary Foxy at Foxy’s Tamarind Bar & Restaurant in Great Harbour, Jost Van Dyke. A similar event hosted by Nanny Cay on the following evening drew a crowd of over 500. Organizers of the event, Mr. Wally Castro as the main sponsor and the event’s producer Mr. Marcos Rivera, are very proud of how the event has developed over the years and have indicated that this is one of the best years in terms of the number of people and the quality of the visitors, citing that it was a more mature crowd. They estimated an attendance of close to 400 boats and around 4,000 visitors. Mr. Rivera was one of the first responders after hurricane Irma hit the BVI, arriving here within six hours after its passage. He along with other Puerto Ricans brought much needed supplies for distribution throughout the islands. Marcos and other Puerto Ricans instrumental in hurricane relief were honoured by the Premier at a cocktail event in Puerto Rico in February this year, for their valiant efforts and demonstrating their friendship and loyalty in the BVI’s time of need. 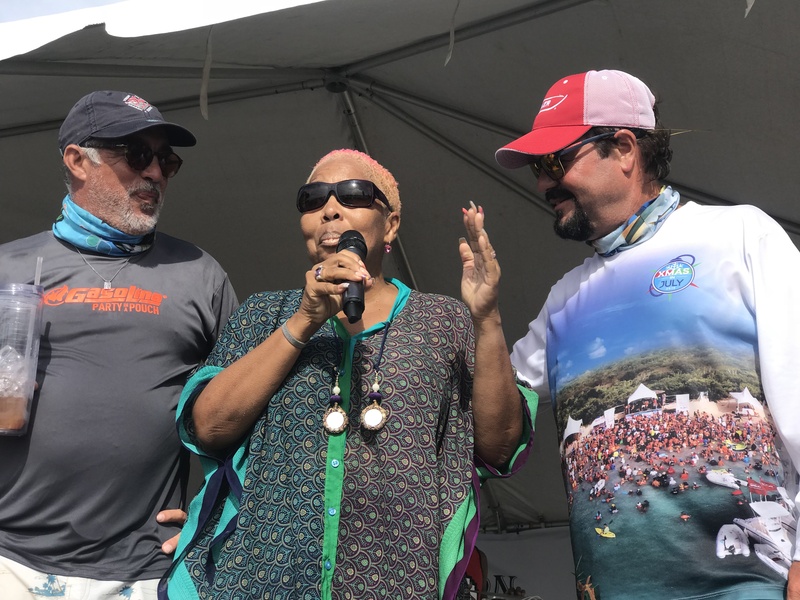 Organizers opened the event to the community, and many Virgin Gordians and local boaters accepted the invitation to party with the Puerto Ricans. Rotaract Club of Virgin Gorda and the Virgin Gorda Festival Committee were also invited to set up stalls on the beach to sell food, and for their fundraising. Beach goers danced to the sounds of two popular Puerto Rican bands along with local band, “It’s a Secret Band”. 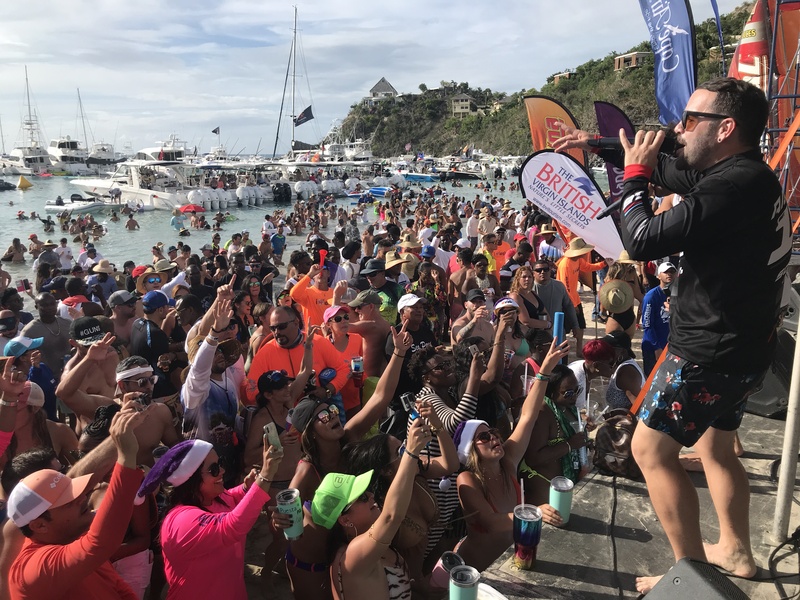 Sponsors of the event included, Cape Air, Boston Whaler, Maz Media, Puerto Del Rey, Boqueron Brewing Co., Bertram, Magic 97.3 and 99.3 FM, Berrios, Tito’s Handmade Vodka, Tropigas, Target, Gasolina, Ron Coqui Blanco, Tequila Patron, Dream Yacht Charters and the BVI Tourist Board.